This past weekend was Nose Games time at Peaceable Paws – and what a fun time it was! We spent two days playing with dog noses, and ended Sunday afternoon with tired and happy canines and humans. This was the first time we’d offered this workshop, and I can’t wait for the next one! Our Nose Games workshop differs from the competitive Nose Work seminar that’s touring the country, in that we explore a variety of scenting opportunities rather than just focusing on the competition, although what we do lays a solid foundation for Nose Work, if that’s where you’re headed. 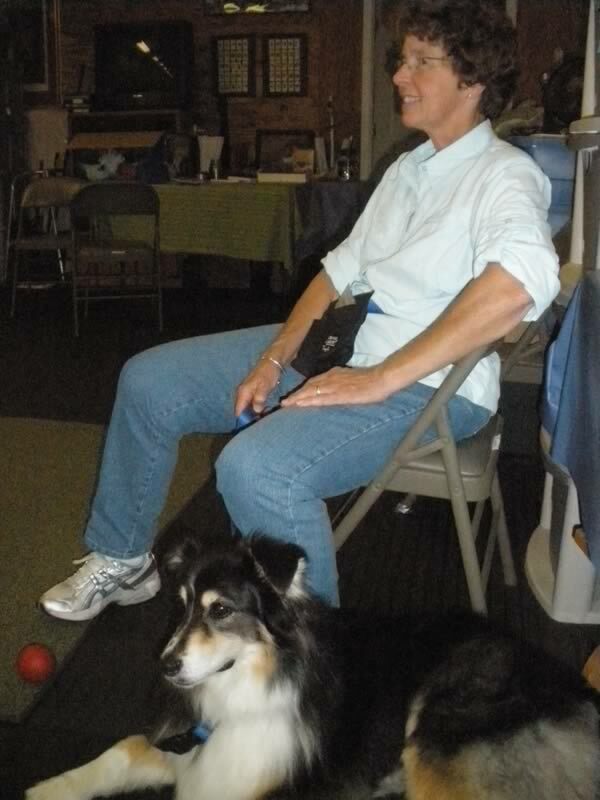 As the trainers in our group discovered, nose games offer endless possibilities for working and playing with clients’ dogs as well as their own. 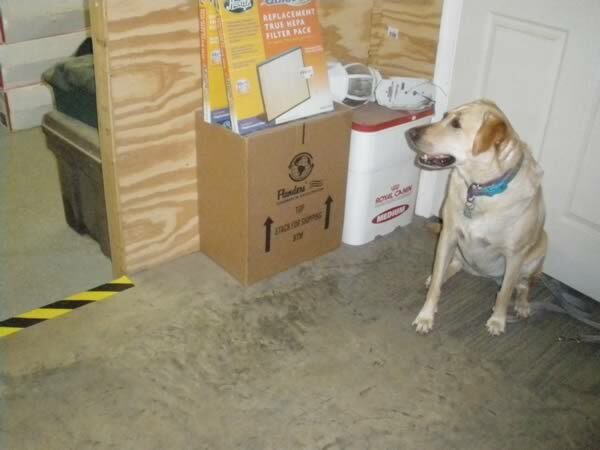 A simple “Find it!” with a treat tossed on the ground is an easy and effective way to engage a dog who knows and has a happy association with the “find it” cue, when his mind and behavior are wandering off to inappropriate zones. 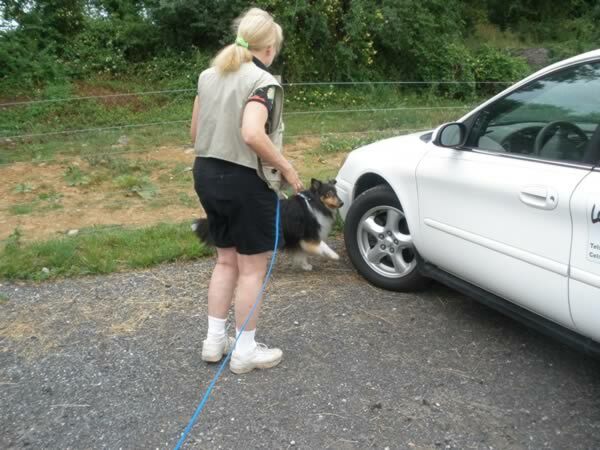 It;s a great way to add more exercise to your dog’s routine, as well as environmental enrichment – for dogs in homes as well as dogs in shelters. It’s interesting to note that, while dogs have an excellent sense of smell constantly utilizing it is, in fact, fairly hard work for them, and tiring. Most dogs, on a hunt, will use their eyes and ears first, and resort to scenting out prey only when necessary, because of the biological imperative to conserve energy for survival purposes. As I anticipated, our workshop dogs needed lots of breaks, and we built in recovery time by pairing teams up and having them watch each other work (an excellent learning experience) as well as taking discussion breaks (also useful for learning) and potty breaks. Leslie Fisher’s Bridgette waits patiently out of sight while mom hides treats. Then enthusiastically and eagerly looks for – and finds – several hidden treats. 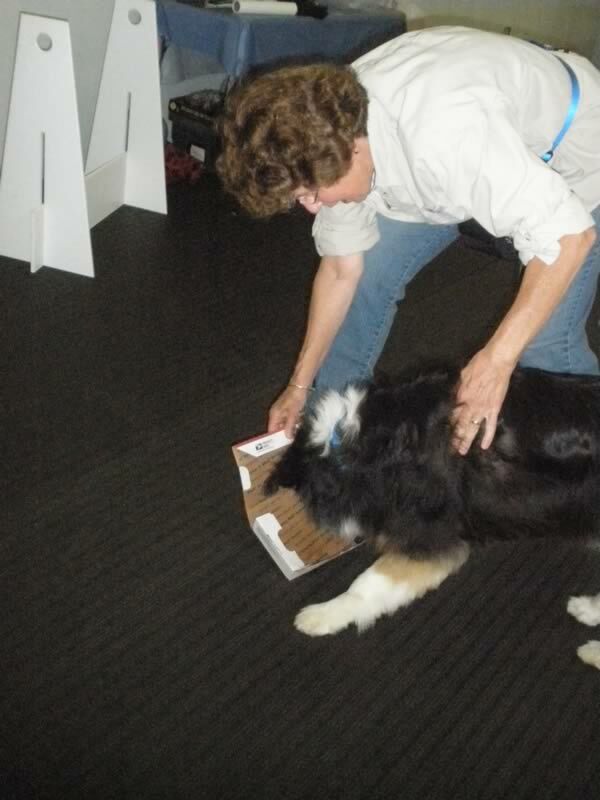 Lynne Young’s Wyatt – who has done this before – marks to indicate he’s found the scent. 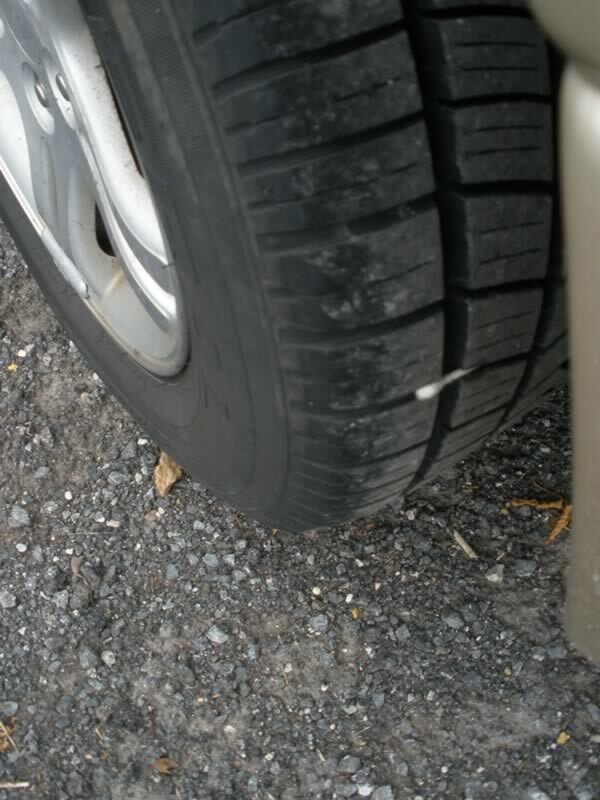 The scent is birch, dabbed on this tiny Q-tip, wedged into the tread of a tire. 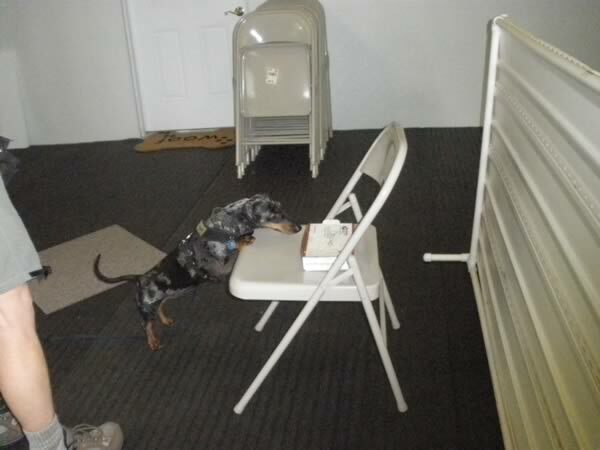 A little mre challenging – Catherine Schuler’s Dachshund, Shade, finds the treat in a box on the chair. A little more challenging – Catherine Schuler’s Dachshund, Shade, finds the treat in a box on the chair. A pause for rest and discussion. The best part for me was watching the dogs progress from Day One when they had no clue what we were doing, to the end of Day Two when they were purposefully searching, on task, for the hidden treats. 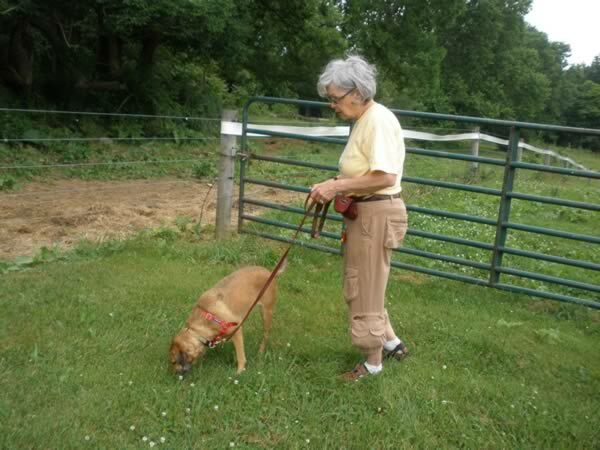 To see Leslie Fisher of Look What I Can Do dog training working with her very enthusiastic and on-task Labrador Retriever, Bridgette, click here. Our next Nose Games workshop is Scheduled for September 11 and 12. Come and have fun with us! Twist and I had a wonderful time!! Sooooo much fun!! I was really pleased with his focus and work ethic at the end of the session. Only regret was not bringing Norm on the second day and seeing if he could “find” Sturgis. I bet Norm finds him AND traces his path to the hiding spot pretty accurately!! Gotta love it when they enjoy training so much!! Thanks! This sounds like SUCH a blast. I think you’ve just inspired me to get a nosework book and start playing with Juni. Is there one you particularly like? Sounds like a great group at the workshop, wish Rocki and I had been able to attend, hopefully we’ll be able to come in September, think the idea of everyone getting a chance to observe other dogs using their noses is a great way to learn how each dog works and to better understand perhaps the behavior of your own dog and how they use their nose. 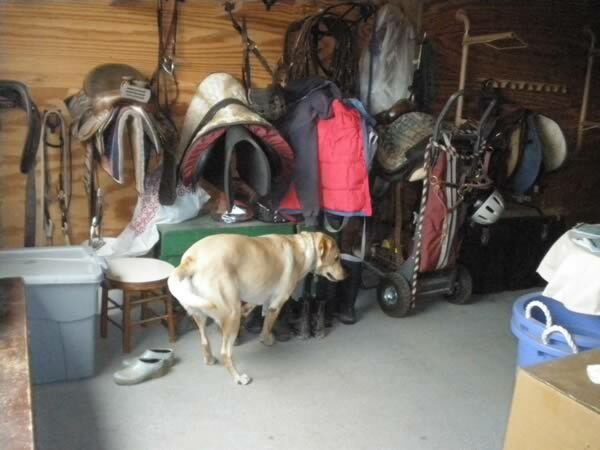 The one thing that fascinates me about it is understanding the flow of the scent and where the dog needs to be to pick up on the scent…and am I interpreting comments to understand you did a find with the dogs for Sturgis? WHAT FUN! We didn’t actually do a Sturgis find – if Barb had brought Norm on Day 2 we were going to, but she didn’t. Next time!